Boys are active. Boys are rambunctious. Let's face it sometimes boys are down right crazy. And I have four of them (under six). They certainly keep me on my toes all of the time. I am always on the lookout for something fun for them to do on days where bad weather forces us inside. Something other than video games. 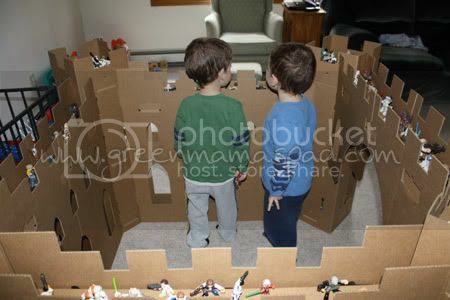 Green Town Toys makes earth friendly corrugated fiberboard toys for kids that are perfect for creative play. "Our mission is to design and manufacture children’s products that inspire imagination, creativity, and fun. Our extensive in-house manufacturing capabilities allow us to ensure prompt delivery, competitive pricing, and unparalleled customer service. In addition, we take the utmost pride in offering sustainable products that are designed and manufactured right here in the U.S.A."
As far as sustainability, Green Town Toys is doing a great job. They have been certified by the Sustainable Forestry Initiative, the corrugated fiberboard contains up to 42% recycled content and is 100% recyclable. In addition, all adhesives and inks used in their products are water-based, non-toxic, and 100% recyclable. So not only will your kids enjoy the toys, but this is a purchase you can feel good about. And being made here in the U.S.A is a huge plus for me. Green Town Toys sent me and my boys The Citadel to try out. 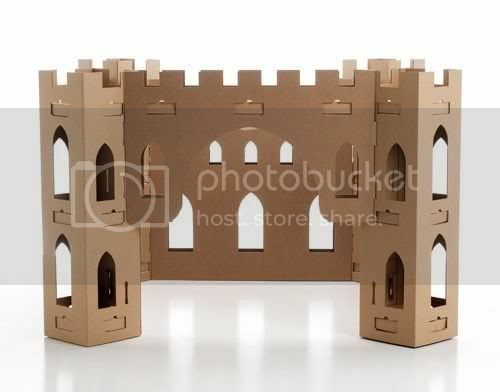 At 54.5" x 54.5", The Citadel is their largest play in toy and can fit 3-4 children. I have to admit that I was so excited to get this and could not wait to get it set up. The Citadel arrived in a fairly thin box considering how big the end product was, and all pieces were folded flat. My husband was able to put this together using their easy to follow instructions in about 35 minutes. And that is with 4 boys touching and "helping" so if he was doing it solo I feel it would have been even faster. I am impressed with the thickness and durability of the corrugated fiberboard. Once it was all set up the boys could not wait to get inside. They can all fit in their quite comfortably and with room to play. Now, my boys love Star Wars. That might be a slight understatement. 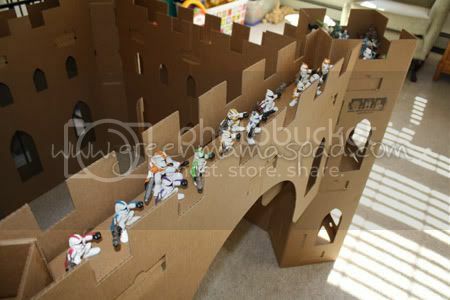 So they decided to grab all of their little Star Wars figures and line them up throughout the Citadel. We had Clone Troopers guarding the entrance and Jedi vs Sith battles in the towers. It was a lot of fun. The Clone Troopers on the bridge. The almost 4 year old twins. And the 16 month old. To add even more fun to this awesome toy, the walls are a blank canvas for your kids to draw on! Hand them some crayons, markers, paint, etc. and let them go to town! I have not yet broken out the art supplies as I am waiting for a good rainy day to do this. The Citadel can also be collapsed for easy storage if you don't want it sitting out all of the time. Instructions with this are included with the assembly instructions so be sure to hold on to them. We decided we are just going to leave it up in our family room all the time because it is so much fun. It has been there for 2 weeks and the boys continue to have a blast with it. For the remainder of April, Green Town Toys is offering free shipping on any order. Plus they are giving Green Mama's Pad readers an exclusive code to save 15% off your entire order! Just use code greenmamaspad at checkout. A 15% discount plus free shipping is an awesome deal so be sure to head over and check out all of their fun toys! One (1) winner will receive a Citadel from Green Town Toys! Who are you trying to win this for and why do you think they will enjoy it? - Visit Green Town Toys and tell me what other product of theirs you like. - "Like" Green Town Toys on Facebook. Please leave me your first name and last name initial to validate. Tell them I sent you! This giveaway is open to legal US Residents 18+ only and will end on Tuesday, May 10 at 11:59pm EST. 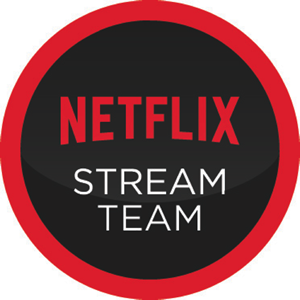 One winner will be chosen at random using Random.org and will be posted on the Winner's Announcement Page. Winner has 48 hours to claim his/her prize otherwise a new winner will be picked. Please leave your e-mail address in all of your comment(s) so I can contact you. I will not share your e-mail address with anyone, it will strictly be used to notify you if you win. Good luck! I would love to win this for my nephew, Hunter. He loves to play pretend, so I think this would be great! I "Like" Green Mama's Pad on Facebook. I Follow Green Mama's Pad on StumbleUpon. I also like The Jolly Roger from Green Town Toys! I'm not entering, but I am just in awe of how fabulous that is! My 5yr old would LOVE this thing - he, of course, would first decorate the whole thing with any art supplies he could get his hands on but after that I know he'd play in it daily! I would love to win this for my son. My son would love it because he is really starting to use his imagination and this would be a great toy to inspire his imagination! I love their Tot Pod too. I feel like I have fallen in love all over again. :-) With a 2 1/2 year and 8 month old these toys are wonderful. I want to win this for my nephews! They'd LOVE it! I "Like" Green Town Toys on Facebook - Pinky S.
like greenmamaspad on facebook lisa w.
I would love to win this for my daughters who love to build. I would love to win this for my daughter because it can go with her creative play she already does. She would just love the shape and size and all that she can do with it. Would love to win this for my kids. They've been playing with the same cardboard box for weeks. This would be great. my friends three kids. they'll love it! My kids. We live in the desert so now is the time we have to stay indoors more during the day. This might help with cabin fever. I would love to win this for my grandson, he loves playing with his knights! My son, because this is freaking awesome! The Jolly Roger looks like a lot of fun too! My daughter is three she would love this. I am trying to win this for my son who is five and my daughter who is 2. I think they would love it. I think my kids would also like the Jolly Roger pirate boat. I follow you via gfc as degood. I left a comment on your fb! I am following you with google friend connect! I would love to win this for my neice. 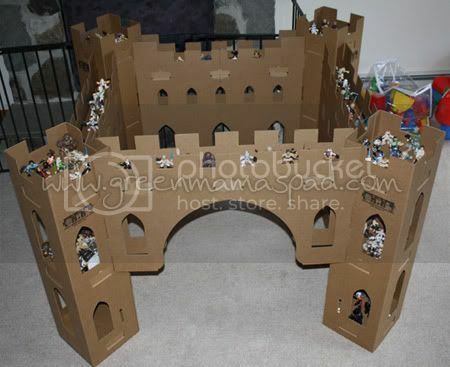 We love to play in "forts" so this would be perfect. The Jr. Executive is so cute! 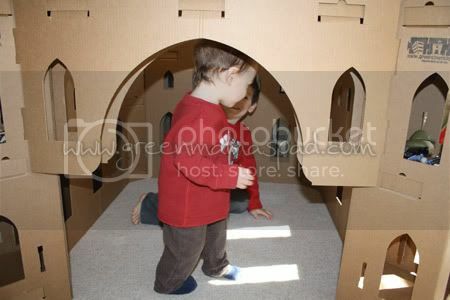 I'd love to win this for my son, he loves playing in forts. This will be for my Niece/Nephew that is due in December. 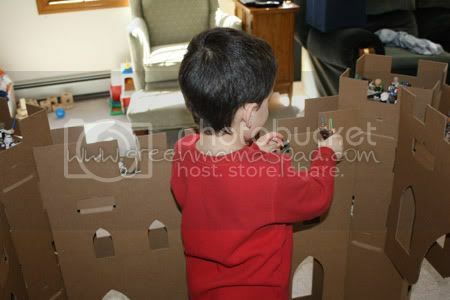 What kid wouldn't want to play in a castle???? I'll be honest and say that I'm trying to win this for my cat. They'd love to play on it and claw it, and I'd get some great pics of them laying siege to the castle. I just know they'd enjoy it because big boxes always become something else with them. I also like the jolly roger. The club chairs. How cute! I follow Green Town Toys on FB.